Well-designed protocols should be self-enforcing, that is, be such that rational participating agents have no motivation to deviate from them. In addition, protocols can have other interesting properties, such as promoting collaboration between agents in a search for a better outcome. 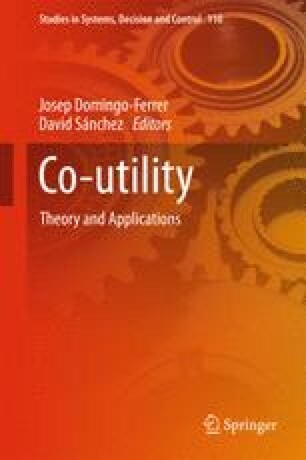 In [7, 8], we proposed the notion of co-utility, which characterizes a situation in which mutual help is the best rational option to take even for purely selfish agents; in particular, if a protocol is co-utile, it is self-enforcing. However, guaranteeing self-enforcement, let alone co-utility, for any type of agent behavior is not possible. To tackle this issue, in this chapter we detail how reputation mechanisms can be incorporated into existing protocols in order to make them self-enforcing (and optionally co-utile). Moreover, we show how to adapt and extend the well-known EigenTrust reputation calculation mechanism so that: (i) it can be applied to a variety of scenarios and heterogeneous reputation needs and, (ii) it is itself co-utile, and hence selfish agents are interested in following it. Obtaining a co-utile reputation mechanism creates a “virtuous circle” because: (i) the reputation management is self-enforcing and, (ii) as a result, it can be used to turn protocols that were not self-enforcing (resp. co-utile) per se into self-enforcing (resp. co-utile) ones.